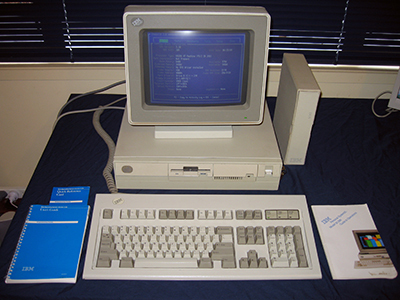 The PS/2 represents one of the lines developed by IBM in 1987 to wrest back market share from the PC clones. Whilst the plan never worked, the line was responsible for several features which were widely adopted by others. This included the 1.44 MB 3.5-inch floppy disk format, 72-pin SIMM RAM, the PS/2 keyboard and mouse ports, and the VGA video standard. That's why an example of this model line is in my collection. Fairly plain on the outside, this PS/2 Model 30-286 was designed to wear a monitor on top like most business computers of the day. At the moment it's maxed out at 4 MB RAM, and is running PC-DOS 3.3 with a bunch of utilities and games on the 20MB hard drive. This unit caused me some grief. It arrived in mid-2008. At first it was working, then the on/off switch became somewhat unreliable. It had to be flipped just the right amount for things to fire. This must have effected the motherboard because eventually the computer failed to go at all, even with a new power supply! Luckily, I found a $13 replacement unit loaded with Dr-DOS, Windows 3.0 and lots of games. The replacement worked perfectly..until I decided to clean it. It then stopped working (Grr...)! I figure I must have shorted something out. After many hours (days!) trying to fix it I gave up and sourced a replacement motherboard (for the replacement!). I now have at least one fully-working machine. The Real Time Clock and Battery Chip has even been fixed! Speaking of the power switch, it is the weirdest thing. Inside the unit, that on-off switch is actually attached to a metal arm, which pushes ANOTHER switch on the power supply. This is a large red switch only slightly smaller than the one found on the original IBM-PC. It seems a oddball way to turn the power on. Why they didn't just wire up the external rocker switch directly to the power supply unit I'll never know! That being said, the power supply fan is the quietest in any PC I own. You hardly know it's on.